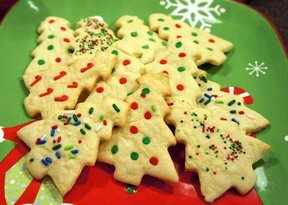 Make fun cutout cookies with this rolled out sugar cookie recipe. Shapes cut out easily and are fun for kids and adults to decorate for any holiday. 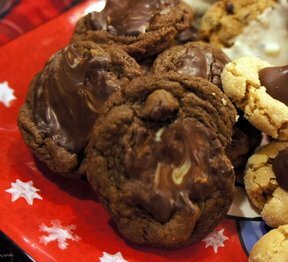 Servings: Servings depends on size and shape of cookie. 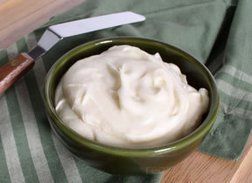 Cream butter and shortening in a mixing bowl for approximately 2 minutes. Add the powdered sugar and beat for 2 additional minutes. Beat the egg slightly and add to the butter and sugar mixture. Also add the vanilla and almond extract. 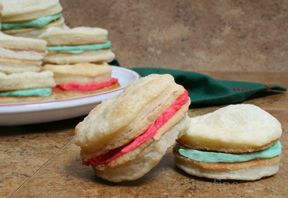 Beat these ingredients together until mixture is light and fluffy. In a separate bowl, mix the remaining dry ingredients. Stir the ingredients until well distributed. Add to the fluffy batter and beat on low with the electric mixer or stir by hand until well mixed. Once the dough is mixed, divide it in half. Form each half into a flattened disk and wrap in plastic. 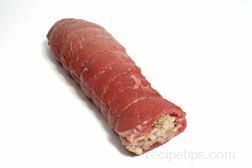 Refrigerate for at least 30 minutes, or until firm, before beginning the rolling process. The dough can be refrigerated overnight if desired. 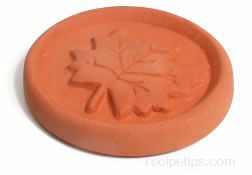 Remove one of the dough halves from the refrigerator. If the dough was refrigerated for over an hour, allow it to sit for about 10 minutes at room temperature before beginning to roll it out. If it is too cold it will crack when trying to roll it out. Place the dough on a lightly floured work surface. Leave the other half in the refrigerator. Begin rolling the dough in the middle and roll outward. Rotate your rolling angle about 45Â° with each roll. Once you have rolled the top half, lift and turn the dough a half turn to prevent sticking and to roll out evenly. If the dough is a little sticky, lightly flour the work surface. Do not over flour the dough. Continue this process until the dough is getting too thin to pick up without tearing. Continue to roll until the dough is 1/8 to 1/4 inch thick. Do not roll too thin or the cookie will break too easily when handling and decorating. If they are too thick they will be soft. Cut the shapes into the dough with the desired cookie cutters, placing them as close as possible to each other to maximize the use of the dough. 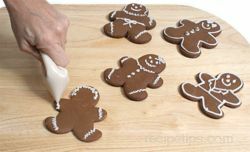 Use a thin metal spatula to carefully lift the cutout cookie off the work surface. 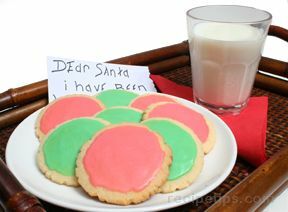 Place the cookies on a cookie sheet lined with parchment paper or one that has been lightly greased. 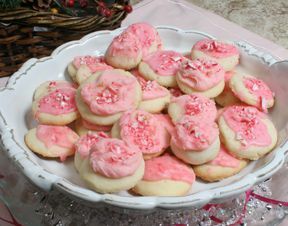 Leave about 1 inch of space between each to allow for spreading of the cookies while baking. 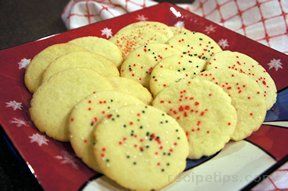 Place the cookies in an oven preheated to 375Â°F on an oven rack positioned as close to the middle of the oven as possible. Bake for 6 to 7 minutes. 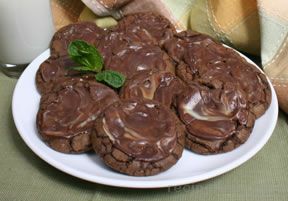 The cookies are done when they start to brown around the edges. 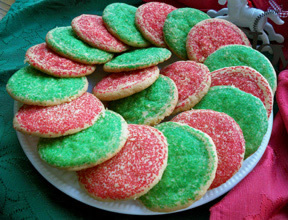 Remove the cookies and place them on a wire cooling rack. 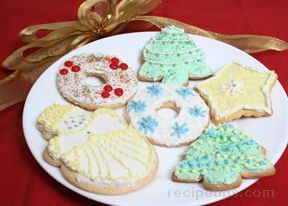 Once the cookies have completely cooled, they are ready to be decorated. 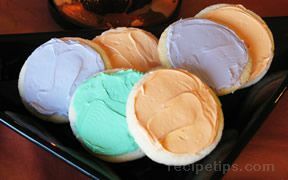 Frost the cooled cookies using the recipe for "White Creamy Frosting" if a softer frosting is preferred. 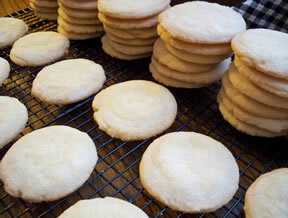 Frost the cooled cookies using the recipe for "Powdered Sugar Icing" if you prefer a topping that is smooth and shiny and will harden after it dries. 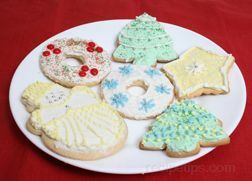 The cookies can also be decorated using other toppings, such as colored sugar, sprinkles, non-pareils, and candies.